ACOUSTIC EXPO 2013: Welcome to our new online acoustic guitar show. This two day event is brought to you by MusicRadar in association with Total Guitar, Guitarist and Guitar Techniques, and we have plenty to keep you entertained and inspired. Quite simply, an Expo is an exhibition. Instead of hosting one in a bricks and mortar building, we decided to host an online show that could reach as many of you as possible. That means you can preview gorgeous guitars, watch free guitar lessons, and read interviews with acoustic's most essential players and songwriters without having to brave the cold and wind. Best of all, it's completely free! What is Acoustic Expo 2013? A two-day online event dedicated to the modern acoustic guitarist. 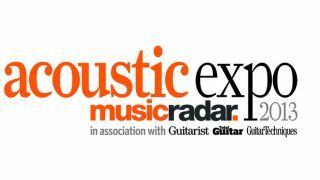 A unique concept in the music-making industry, Acoustic Expo 2013 covers gear (product video demos), seminars (video lessons and tuition) and artists (interviews and features). When you go to a guitar exhibition, you have the chance to browse booths loaded with six-string goodness. Well, it's the same deal at Acoustic Expo 2013: we have a number of virtual gear booths for you to scout out to find your next guitar or amplifier purchase. Our virtual booth exhibitors are Lowden, PRS, Takamine, Gibson, Faith Guitars, HK Audio, Guild, Marshall and L.R. Baggs. With each virtual booth comes a series of gear articles dedicated to each individual brand. From painstakingly hand-crafted guitars to acoustic amplifiers and a mini, portable PA, the Gear Channel is packed with products you need to see. To do so, simply click on the booth names above to view their gear articles, or head straight to the Gear Channel and mix it up. Like any great show, we want you to come away from ours with a bag of new tricks and techniques that improve your guitar playing. That's why we've devised a brand new mini tuition series, presented by Tristan Seume, to take your acoustic guitar skills to the next level. Tipping our hat to a range of modern heroes and guitar greats, you will find lessons in the style of Ben Howard, Jake Bugg, Chet Atkins, Newton Faulkner, Seasick Steve and more. We also have guest lessons and performances from the likes of Raul Midon, Union Station, Andy McKee, Joe Brown and Antonio Forcione to keep you entertained. Some of these are live right now, while others will be live tomorrow, so keep coming back to nab those free expert guitar lessons! No show would be complete without a healthy dose of artists, and for Acoustic Expo 2013 we have sought out brand new interviews and features with promising newcomers, platinum-selling acoustic singer-songwriters, and some truly inspirational players to boot. We have one-off blogs written by Lisa Knapp, Corey Taylor, Will McNicol and Ben Taylor; features with The Lumineers, Scott Matthews, Foy Vance, Lloyd Yates, Will McVarlery and others; plus gallery features starring Johnny Cash, Dave Matthews, Paul Simon, Of Men and Monsters and a load more. As with the Seminar Channel content, some of these interviews and features are live right now while others will be live on day two. Don't forget to enter our competition to win a Gibson J35 guitar worth £1,199 / $1, 878. Click here for more details. Check back bright and early tomorrow morning for fresh new content to improve your playing, spark your song-writing imagination, and expand your gear collection with Acoustic Expo 2013.